Without a doubt, more myths exist about this subject than any other in the "Martial Arts". Stories about delayed death touches, knocking out a person by just touching them, "secret" nerve strikes or pressure points, abound. TO DATE I have yet to see ANY scientific proof of the actual existence of these techniques. In my opinion these stories are told by instructors to keep students by the promise of "occult knowledge". Who wouldn't spend money to learn secret knowledge that would give us great power over others. Also, it allows the instructor to keep the training at a level that will keep students, instead of driving them away. Keep in mind that most schools come from a "sporting" or "traditional" base. I strongly believe in using sporting events to develop certain skills, but if the end goal is winning a medal, then you will never learn effective self-protection methods. The problem with the "traditional" approach is we are in the 1990's. What someone thought was a wonderful idea when men rode horses and used swords, may be a stupid idea now that goblins travel in packs, armed with assault weapons! The person running the school is in business to make money, as they should be. But the things a person needs to do to prepare themselves to survive a violent assault, are things that drive the paying student out the door. Other schools are teaching a "new age" religion. Filling students heads with nonsense about mystical powers, secret techniques, and "death touches". It's no wonder when the average "martial artist" finds him/her self in a violent encounter, they end up a battered loser! If a .38 special bullet fired into a person only stops them about 50% of the time, JUST HOW EFFECTIVE DO YOU REALLY THINK A PUNCH OR KICK IS? "Well, I'll just use Dim Mak or Kyusho-jutsu to hit nerve centers that would drop an elephant". No, you won't! Do you know what the "Tache-Psyche" effect is, and what it does to you? When you're looking the Goblin in the eye, and you're in the grip of "tache-psyche", the motor skills of the fingers and hands break down! Slap, tap, rap, or nerve strikes to spots the size of a dime, are IMPOSSIBLE under extreme stress. Believe me, when you are looking at six men who plan to beat you to death, you're going to be under stress! Another VERY IMPORTANT consideration today, is the HIV virus and the fear of AIDS. The one knuckle strike to the point under the nose and above the upper lip, was and is a very powerful Atemi-waza strike. However, the strike will split the lip, and his teeth could cut your hand. His blood is now in your open wound! That is an unacceptable risk in today's world. The simple reality of combat is that we must keep this stuff very simple. Strikes like the heel hand/tiger claw are high on the list as they do great dammage with little harm to the hand. In terms of vital points it is simple; the primary attack targets are the eye and the instep. Simply because if he can not see you, or chase you, you can escape. If a primary target is not open; then use a secondary target (nose, throat, groin, knee) to open up a primary one. Note: the groin is a secondary target because many attackers wear a cup as they know they are going to be attacking people. In combatives, the use of Atemi-Waza is to prevent our attacker from thinking about anything other than pain. You cannot think of two things at the same time. It can't be done. If you're thinking about what just hit you (called "damage assessment"), then you can't think about hitting! It is very important that you develop the ability to find, and strike, these areas under any and all conditions. Your life, or the lives of your loved ones, could one day depend on your ability at Atemi Waza. I wrote the above well over 10 years ago; but it does show how the psychic discussion does relate to this subject. =)......one with a wit about him/her SHOULD understand. 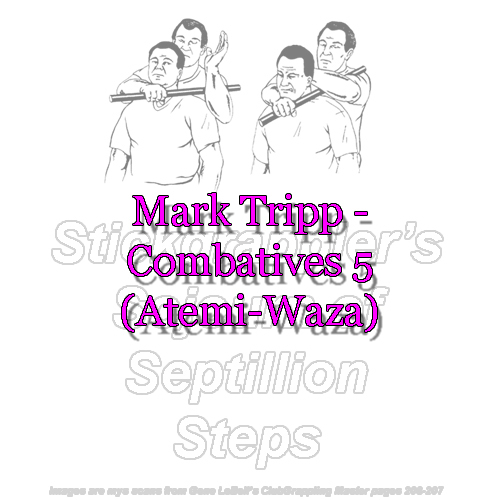 Glad to see you moving on to the combatives, Coach Tripp. Lots of stuff bogging down this forum, good to keep moving on. I think I said it before, but it bears repeating, it is good to find a high level grappler who is willing to admit the difference between street, sport, and police/corrections/security type of training/combat. Actually, the pressue point strikes in Kyushu-jitsu can and have been proven by Western medicine. The knock out points are nothing more than compressing an artery(like a choke, perhaps) for split second which can cause a momentary drop in blood pressure, causing a knockout. Don't believe me? Every KO in prizefighting history was caused by striking a point on the body that appears on the meridian maps of every massage therapist(the temple, the hinge of the jaw, the chin, or even the solar plexis). All pressure point manipulations, however, as I said, their validity can be proven by Western medicine (as well as by the experiences of many of us in the dojo). Since the validity of these points can be proven, that means that there is no "magic" to me at all. Explained to me by one of my instructors, who has a black belt in Kyushu/Tiute-jitsu, modified by me. In closing, I think you should be careful how you debunk the fakes and posers out there for using "mystical" techniques, because I know for a fact that you have defeated opponents by manipulating their gall bladder meridian. Don't believe me? Look at the massage therapist dummy. You will see that the gall bladder meridian runs up the neck. When you use Hadaka-Jime to manipulate the gall bladder meridian, you are cutting off blood flow to the brain. No magic involved, just Biology and Physiology. While many people now are ready to fight at the drop of the hat; you will find it much less embarassing if you carefully read before you jump to a conclusion I did not make. Please tell me where I posted that the nerve strikes wouldn't work? What I said was; under extreem stress they require a degree of hand eye skill that is all but impossible for the average person to do. In reality he walked past me and sucker punched me. Much of this is simple auto-suggestion and proper testing would require that you eliminate that from the mix. I have often thought if you brought in an old chinese guy who had NO knowledge of pressure points; but you made people think he did; how many people would drop when he touched them (remember the aikido story). For combatives the skill level needed to hit that correctly simply isn't there. I have video of police in gun battles as close as 7 feet and even though BOTH men empty their firearms, NO ONE gets hit. That is the only point I am making here. "When you use Hadaka-Jime to manipulate the gall bladder meridian, you are cutting off blood flow to the brain. No magic involved, just Biology and Physiology. " Actually; that is not correct. There are various places on the web where Judo's art of Shime-waza is discussed at great length. You will find that it is about blook pressure not blood flow that is the reason the person passes out; and that the gall bladder doesn't have a thing to do with it. Someone will post the site, I am sure. But the things a person needs to do to prepare themselves to survive a violent assault, are things that drive the paying student out the door." Could you discuss this please? Unless you are getting to it Coach. Sorry to hear you're hurt. What happenend, MTripp? Old injuries turning into cronic problems as I approach the big five Oh (as in Oh Oh!). Finding it very hard to lift my left arm up due to all the shoulder injuries over the years. I've just started reading Angry White Pyjamas, a boom about a man who took the year-long Yoshikan aikido course given to the Tokyo Riot Police. He says Gozo Shioda said that 70% of streetfighting is atemi. Notice the placement in the O waza. Mark, blood pressure, not blood flow. Absolutely correct. Thank you for posting this. I second sonnon`s post.It`s pressure not flow. NOTE: Posted as-of May 24, 2000 on Nov 22, 2013 to mirror my old archives - http://stickgrappler.tripod.com/ug/mtcombat5.html.